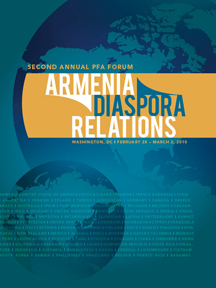 Armenia-Diaspora relations have never been more strained in the 20 years since independence. To provide an opportunity for academics, policy practitioners, and the public to discuss perspectives on, and approaches to, the present-day challenges facing the Armenian nation Policy Forum Armenia held its 2nd Annual Forum in Washington, DC on February 28-March 2, 2010. In it's first high level Economic Forum, PFA brought together an unprecedented line-up of academics and policymakers from Armenia, Russia, Turkey, Ukraine, and UAE, including Armenia’s five former Prime Ministers, to discuss the implications of the crisis for Armenia and help devise policy prescriptions to mitigate them. As in the 1st Forum, the 2nd (Armenia-Diaspora) Forum gathered a large number of intellectuals—academic and public policy practitioners—to discuss challenges and help devise new modes of engagement between Armenia and its Diaspora. Day 2 of the Forum was held at Georgetown University. This part of the Forum was open to the public. Mr. Raffi Hovannisian, Armenia’s First Foreign Minister, delivered the keynote luncheon address on Day 2 (March 1). The program for Day 3 (March 2) was limited to only young professionals and included thematic meetings with various international agencies and public and private organizations in order to continue the discussion on Armenia-Diaspora relations and offer young professionals opportunities to network in Washington. The presentations and themes covered during this forum are shown below, with presenters slides and papers available for you to download. How Are Diasporans Informed About Contemporary Armenia?